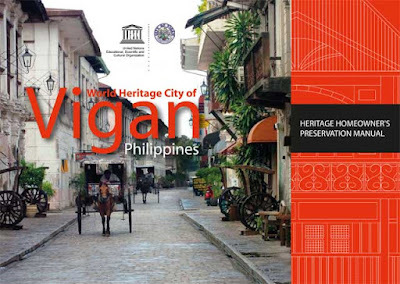 Some months ago, Ric Favis of UNESCO Bangkok mentioned to me that the Heritage Homeowner's Preservation Manual for the World Heritage Site of Vigan, Philippines, co-published by UNESCO and the City Government of Vigan, was already available. According to Favis, "The manual is a practical guide to conserving ancestral houses and related historic buildings not only in Vigan but elsewhere in the Philippines. It provides guidelines based on traditional building techniques and modern scientific methods for maintaining and conserving historic structures." I finally got myself a copy and it's indeed something a heritage house owner must have since it guides owners on how to conserve, maintain and even fund restoration of ancestral houses. The table of contents and information on how to get copies of the manual can be found in the UNESCO Bangkok website. Another UNESCO Bangkok publication I got was IMPACT: The effects of tourism on culture and the environment in Asia and the Pacific: Sustainable tourism and the preservation of the world heritage site of the Ifugao Rice Terraces, Philippines. It's quite a long title. The publication gives us a picture of what tourism has done to the Rice Terraces of the Philippine Cordilleras and the communities that live there. 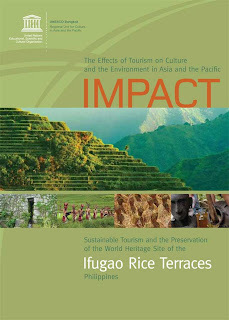 The booklet was prepared by the Save the Ifugao Rice Terraces Movement (SITMo). And the good thing is that a complete .pdf copy can be downloaded from the UNESCO Bangkok website. You can check the e-Library of UNESCO Bangkok for more downloadable resources.